Black & Decker is the maker of many different home appliances, ranging from irons, hand tools and power tools to larger items, such as lawn mowers. One variety of lawn mower available from Black & Decker is an electric version that charges an internal battery to power the mower. 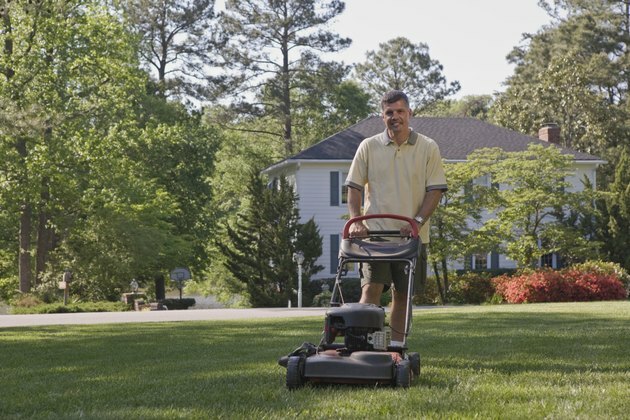 If you experience a breakdown or malfunction in your mower, there are a few repairs that you can perform that can get the mower up and running. Plug the charger into the lawn mower and wait for the indicator on the charger to turn green, which means the charge is complete. Fully charging the mower will correct several malfunctions. Let the mower rest for at least one minute after the lawn mower stops working. This will allow the circuit breaker inside to reset itself if it tripped when you were using it. Push the safety key down and make sure it is fully set in the mower. The safety key is located right above the motor of the mower and is usually below the handlebar. A safety key that is partially removed from the mower will prevent the lawn mower from functioning. Pull the safety key out to disable the mower and turn the mower over so you can see the blades. Remove any grass or dirt that may be obstructing the path of the blades. Make sure there are no large blockages within the well above the blades. Check the blades to make sure that they are level and whole. If the blades are bent or chipped, you should replace them, as faulty blades will result in poor or no function of the mower. Turn the mower over and raise the height of the blades to the highest setting. The height controls are located to the right or the left of the motor, along the edges.